College Football Week 2: Clemson at Texas A&M on ESPN is Most-Watched Game on Any Network - ESPN Press Room U.S.
ESPN led the way in college football’s second week, airing the most-watched game among all networks – broadcast and cable – and, combined with ABC, three of the top four games. The two networks also shined in prime-time, as ESPN and ABC aired the two most-watched games among all the competition, and factoring in ESPN’s final game window of the day, the three most-watched Saturday night games across broadcast and cable. Clemson at Texas A&M (7 p.m.) on ESPN delivered a Nielsen total live audience of 4,486,000 viewers, the most-watched game of the weekend and cable’s second most-watched Saturday game since November 2016. The thrilling ACC-SEC matchup propelled ESPN to ‘win the night’ among all broadcast and cable networks, as the network ranked first in all key demos including: households, viewers, men 18-34, men 18-49, and people 18-34. ESPN has now ‘won the night’ among viewers twice this college football season, and led all networks in the key men 18-34 demo in four nights this season. Combined with ABC, the two networks have led in the demo five times. Significant Audience Increases: The nearly 4.5 million viewers is up 33% from ESPN’s similar window last year, which also featured Clemson, as the Tigers hosted Auburn. High Drama Peaks Audience: The audience peaked at nearly 6 million viewers as the Aggies attempted a two-point conversion to tie the game with under one minute to go (10:30 – 10:41 p.m.). ESPN/ABC Lead in Prime-Time: ESPN topped the broadcast competition by 96% and its cable competition by 1035%. ABC’s Saturday Night Football Penn State at Pitt (8 p.m.) beat its broadcast competition by 43%. Michigan State at Arizona State (10:45 p.m.) delivered a Nielsen total live audience of 2,297,000 viewers, the most-watched finale Saturday game window since October of last season (Washington at Arizona State). The viewership for the Sun Devils’ last-second victory was up 81% year over year (Boise State vs. Washington State) and was the third most-watched game Saturday night behind Clemson-Texas A&M and Penn State at Pitt. ESPN2 joined ESPN in airing the most-watched games on cable, as the network’s airing of Arkansas State-Alabama (1,663,000 viewers) and TCU-SMU (1,076,000 viewers) were in the top five most-watched cable games in week 2. Mississippi State at Kansas State on ESPN had a Nielsen total live audience of 1,800,000 viewers, joining the aforementioned Clemson-Texas A&M and Michigan State-Arizona State games as the only games to generate a larger cable audience. 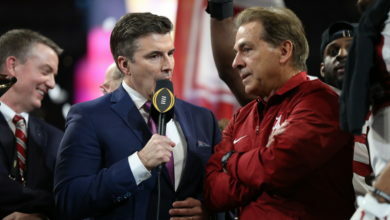 The audience for the Crimson Tide’s victory is the second most-watched game on ESPN2 since Alabama’s last appearance (Sept. 9, 2017), while the Friday night telecast was up 11% and the Saturday primetime telecast up 8%. College GameDay Built by The Home Depot averaged 1,792,000 viewers across ESPN and ESPNU for its show from College Station, Texas, up 13% from last year’s week 2 telecast from Columbus, Ohio.